Fabric Beds There are 43 products. Our Alabama storage bedstead is the ultimate in luxurious comfort and style. Available in different size. The softly curving scroll head and footboard design evoke a traditional style whilst practicality is accounted for too with two large storage drawers. 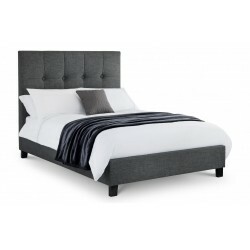 The Luciana luxury upholstered chenille bedstead is the ultimate in modern contemporary design, featuring an opulent sweeping curved headboard with sumptuous padded,Available in different size.Detail this bedstead is crafted by master-craftsmen with attention to detail which you will rarely come across. Our contemporary bed frame comes in a number of sizes, colours and fabric options. Finished in a rich faux leather or luxurious hopsack fabric, this range will appeal to all. The headboard features a subtle ‘H’ stitched design which adds an extra dimension to this great bed. Sprung slats come as a standard and best of all. Hazel Chocolate Upholstered Bed. This elegantly refined bedstead will suit modern and traditional interiors. Hazel is available in a choice of three different colours, helping it to blend and match with the wider bedroom. Available in Chocolate or Ice or Wholemeal or Olive or Line or Plum with different sizes. Chelsea Upholstered Bed. Sharp lines and elegant proportions define this luxurious bedstead. A range of four different leg finishes will ensure a match with any planned interior, while four different sizes will enable this striking design to fit virtually any bedroom layout. Available in Cream or Charcoal or Fudge finish with different sizes. The Valencia Upholstered Bedstead in Double boasts a striking presence. With a plush and elegantly styled headboard, this bedstead is sure to bring a touch of refinement to any bedroom. Finished with subtle detailing, this piece has an understated presence that will effortlessly complement any bedroom. Available in Beige Finish. A stunning grey fabric bed frame. The Eaton Grey Fabric Bed features a rounded headboard with button detailing and contrasting wheat trim. Complementary beech feet add the perfect finishing touch, whilst laminated wooden slats ensure excellent mattress support and ventilation. The Horcae is a stunning contemporary fabric bed frame with its unique design and chrome corner feet will bring a modern touch to any bedroom. Upholstered in a soft touch grey coloured fabric, the Sareer Serenity Horace bed frame is the perfect choice for those looking for a designer addition to their home. Available in Grey finish and Double Size Only. The Sareer Fabio Velvet Fabric Bed Frame. This upholstered bed frame will add a luxurious touch to any bedroom. Make a bold style statement with the Sareer Fabio Royal Blue Suede Bed Frame. Available in Blue with different sizes. The Sareer Bosco Suede Contemporary Bed Frame using on-trend buttons and curves is both great to look at, and designed with your comfort and support in mind. It’s Royal Blue colour perfectly complements the wooden legs. Available in Blue finish and Double Size only. The Marcell Bed is a Luxury Studded Fabric Bed Frame a opulent and grand upholstered fabric bed frame is a great centre piece addition to any bedroom.The Sareer Marcell with its large headboard and footend features studs and button detailing providing an additional touch of class. Available in Grey with different sizes.